Capital Metro MetroRapid bus. Photo: CMTA blog. 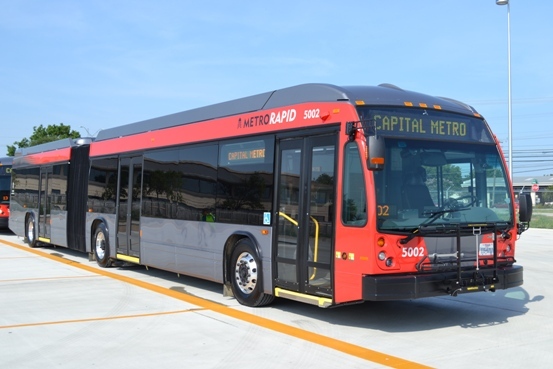 Capital Metro’s MetroRapid bus project received its $38 million of Federal Transit Administration (FTA) funding through its designation as a “Bus Rapid Transit” project under the FTA’s Small Starts program. But calling a bus operation “rapid transit” that will run predominantly in mixed motor vehicle traffic seems either rather fraudulent, self-deceptive, or a branding effort that has descended to the ridiculous. Yet some local officials, planners, and enthusiasts of the officially promoted downtown-to-Mueller Urban Rail route have been vigorously singing the praises of MetroRapid as a viable and equivalent substitute for light rail transit (LRT) in the Guadalupe-Lamar corridor. Even LRT, which typically runs entirely or predominantly in reserved or exclusive alignments, and (for comparable levels of service) is faster than so-called “BRT”, isn’t called “rapid transit”. Despite an agency goal of offering time savings of 10 percent, in hopes of attracting more people to buses, the two lines would mostly offer minimal time savings, according to a Capital Metro presentation on the MetroRapid bus system, now scheduled to start operating in 2014. In one case, a MetroRapid bus running from Howard Lane in North Austin to downtown would make the trip in 47 minutes — the same as an existing limited-stop bus that runs the same route. Trips between South Austin and downtown on that same line would offer time savings of just two to three minutes. Community public transit activist Mike Dahmus, in a blog entry titled Rapid Bus Ain’t Rapid, 2011 Confirmation, provided schedule evidence from CapMetro’s own website indicating that travel time differentials between the proposed Route 801 service (North Lamar-Guadalupe-South Congress) for atypically long trip lengths were minimal — time savings of 0 to perhaps 3 minutes even for such unusually lengthy trips as journeys between far-flung transit centers. And in another article titled Rapid [sic] Bus Fact Check: Will It Improve Frequency? Dahmus offered a cogent argument that headways (thus waiting times for passengers) would be increased, not decreased, with MetroRapid service in the Route 801 corridor. Assuming the most likely operating scenario, Dahmus figures the number of scheduled bus trips in an average hour would be reduced from 9 to 8 — i.e., an increase in service headways and concomitant increase in waiting time for passengers. A rapid transit system is a public transport system in an urban area with high capacity, high frequency not needing timetables, is fast and is segregated from other traffic…. 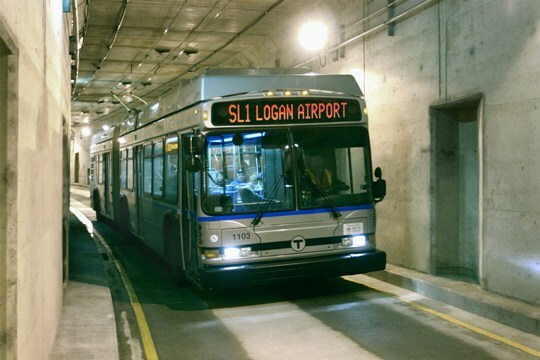 Operating on an exclusive right of way, rapid transit systems are typically grade separated and located either in underground tunnels (subways) or elevated above street level (elevated transit line). … Modern services on rapid transit systems are provided on designated lines between stations typically using electric multiple units on rail tracks, although some systems use guided rubber tyres, magnetic levitation, or monorail. • “Metro”. International Association of Public Transport. • “Glossary of Transit Terminology”. American Public Transportation Association. • “Rapid Transit”. Encyclopedia Britannica. 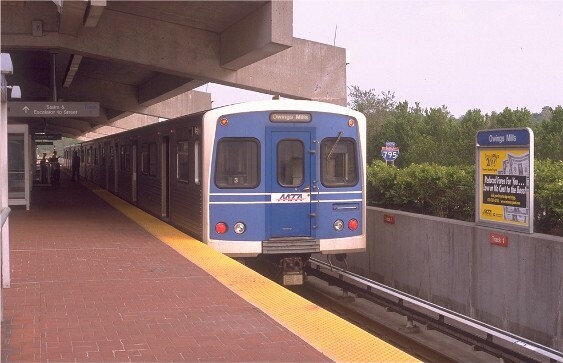 In the USA, the term “rail rapid transit” has a de facto meaning of such an urban electric metro or subway/elevated system, running entirely (with rare exceptions) on its own, exclusive right-of-way, with no grade crossings or other interference with street traffic or pedestrians. It would seem reasonable that the public, political and civic leaders, and transportation professionals should hold “bus rapid transit” to the same standard. 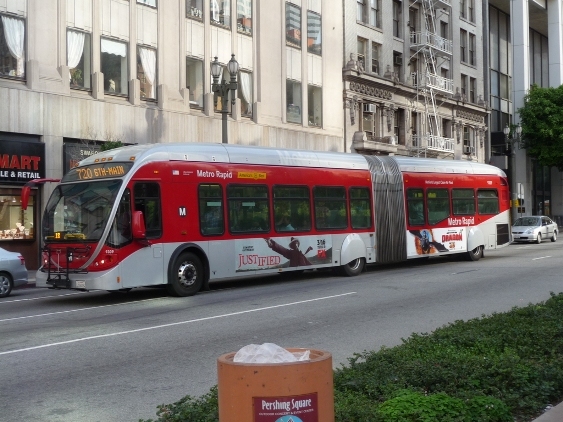 Certainly, “bus rapid transit” should not be applied to bus operations running merely in reserved traffic lanes, or in and out of mixed and reserved or exclusive lanes, etc. — yet these are precisely the kinds of operating applications that FTA, and several major BRT advocacy organizations, have been blithely characterizing as “BRT”. To call a modestly enhanced bus operation “rapid transit” while denying this designation to a streetcar/light rail operation with much or most of its alignment in exclusive or reserved ROW seems like branding gone haywire — particularly so when the buses depart from the totally exclusive alignment and meander on routes in mixed traffic. 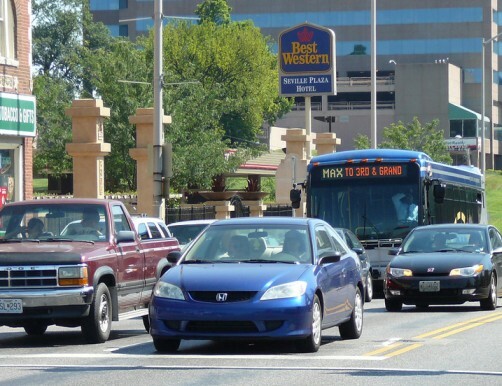 Why should a bus coming down the street, waiting in traffic jams, etc., be called “rapid transit”? This would seem to make a mockery of the term. In effect, the term Bus Rapid Transit is being applied to service/capacity mode configurations that are significantly inferior not just to Rail Rapid Transit but to Light Rail Transit — and that would seem highly misleading, especially to the general public. For these modestly improved bus services, a term such as Bus Premium Transit would appear more accurate and appropriate. The section below provides a brief photo-summary distinguishing among bona fide rail rapid transit and bus rapid transit, and Bus Premium Transit operations erroneously (and widely) characterized as “BRT”. Baltimore Metro. Photo: Doug Grotjahn. 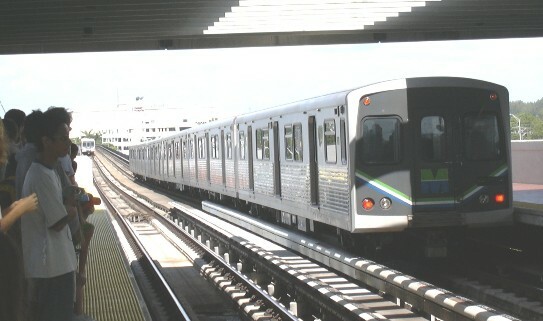 Miami MetroRail. Photo: L. Henry. 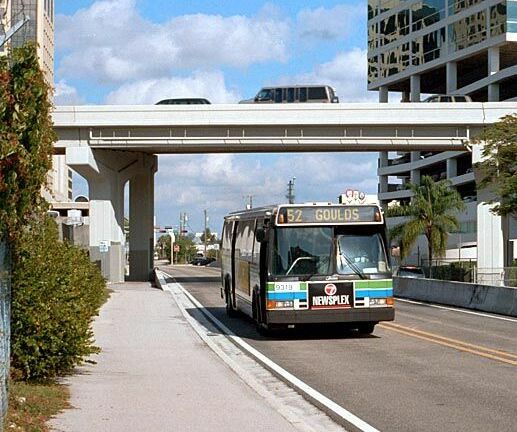 Miami-Dade County Busway. Photo: Jon Bell. 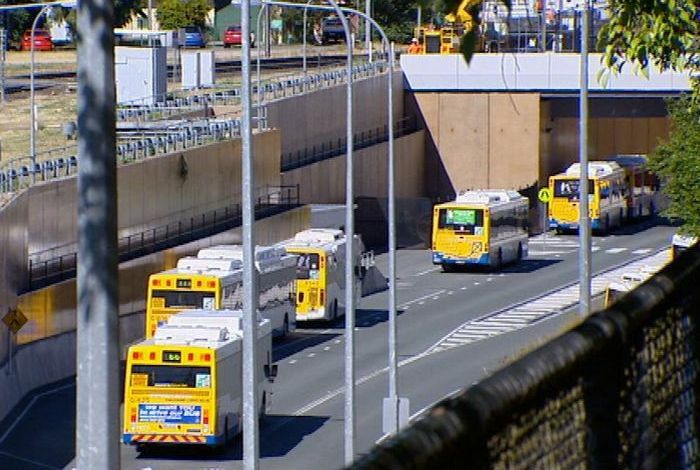 Brisbane (Australia) busway. Photo: That Jesus Bloke. Boston Waterfront Silver Line. Photo: Massachusetts Government blog. Los Angeles MetroRapid Route 720. Photo: Sopas EJ. Kansas City MAX premium bus service (branded as “BRT”). Photo: Metro Jacksonville. Bottom Line: With MetroRapid bus service, Capital Metro does seem to be modestly upgrading current bus service in the Guadalupe-Lamar corridor and elsewhere with spiffier station facilities and newer buses — improvements that most bus riders, and probably the public in general, would welcome. But an acceptable substitute for urban rail … it ain’t.